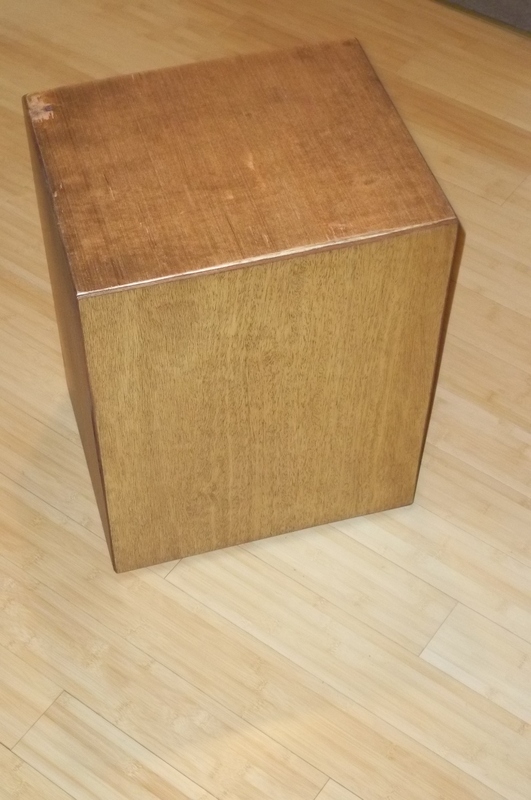 With the indispensable help of wood shop mastermind Derek, I constructed and stained this excellent cajon, which, if you don’t know, is a percussion instrument based on a shipping crate that probably came from Peru, although it depends who you ask. It sounds great, and a neat thing about cajons (cajones?) is that because they’re based on actual repurposed boxes, any mistakes, scratches, or poor joins can be written off as authenticity. Apparently it sounds better if you leave it full of sawdust. the sides are 1/4″ plywood, and the face is, uh, something thinner than that. I’ll post a tips and tricks guide to its construction soon. Jesse Conlang lives in Edmonton, Alberta, where he has trained squirrels to operate pens and pencils at his whim. You can probably tell that by the quality of the work. This entry was posted in Stuff I made and tagged cajon, craft, homemade, instrument, latin music, music, percussion, peru, plywood, woodworking. Bookmark the permalink.